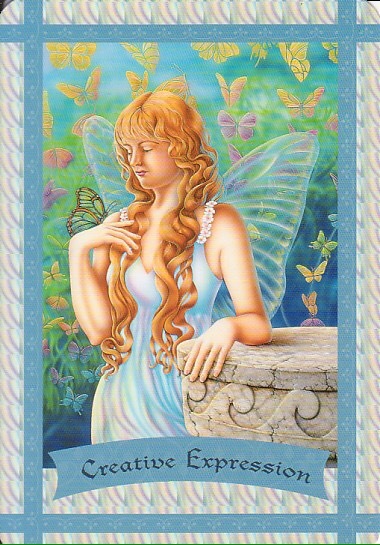 Card: Creative Expression – from the Healing with the Fairies Oracle Cards by Doreen Virtue. Message from Erin: I was just thinking earlier today about how I would really like to write a poem. I have no idea what the poem will be about. In fact, I hardly know anything about writing poetry. I just thought to myself: I want to write a poem. I had a moment afterward where I said to myself: but what if I’m a terrible poetry writer and someone will read it and laugh. The Faeries response: Who cares! I had another thought today about how I really wish I had kept doing art after high school. I was never particularly great at it, but I really enjoyed it. It made me feel good and it was a great creative outlet. I also used to do pottery, and I was thinking of taking a pottery class this summer if I could. I really want to throw some clay on the wheel again. It doesn’t really matter if what I produce in art has any value to anyone else. That’s really not the point. Art, in whatever form, is a way to express a part of ourselves that needs to get out. Of course it’s nice if other people like it, but ultimately it’s something that we do for the soul. It’s a way that we can fly without wings. I was thinking about scientists recently, and the process of coming up with theories and new ideas. It occurred to me that a lot of scientists are actually very creative people. I think it requires a very big imagination and the use of intuition to figure out how things work, or how to make a new invention. It’s really quite remarkable. The Faeries would really love us to make time in our lives to express ourselves creatively. Whatever works for you: drawing, painting, singing, poetry, dancing….it doesn’t matter what you choose, just so long as it’s something you enjoy doing. It’s a great form of therapy and a way to release emotions. It’s essential for our well-being. I hope you all make time for yourselves to be creative. This entry was posted in Faerie Reading and tagged art, creativity, doreen virtue, expression, faerie, fairy, oracle cards, Tarot by faeriemessenger. Bookmark the permalink. Thanks for the words of encouragement, Sophia. Much appreciated. I’ll definitely take some time to be creative this week :)? Take & Make the Time to Explore Your Creativity!